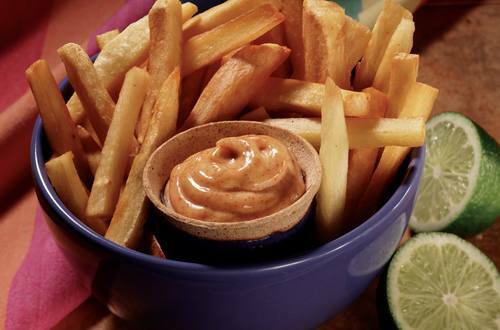 1 Combine Hellmann's® or Best Foods® Real Mayonnaise, lime juice, garlic, paprika and cumin in medium bowl; set aside. 2 Bring water and salt to a boil in 3-quart saucepan. Add yucca; boil 30 minutes or until tender. Drain and chill. 3 Heat oil in 2-quart saucepan over medium heat and fry yucca, in two batches, 5 minutes or until crisp; drain on paper towels. Sprinkle, if desired, with additional salt and serve with Spiced Mayonnaise.